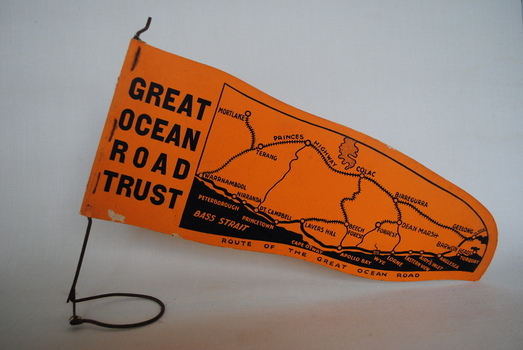 The Anglesea and District Historical Society is a non-profit organisation staffed by volunteer members of the community, whose aim is to research and preserve history of the local area. We welcome new members. 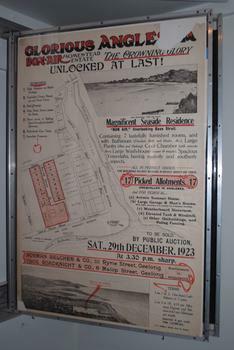 We have a collection of articles that come from homes and businesses in Anglesea. While there are some general articles we are trying to concentrate on local history. 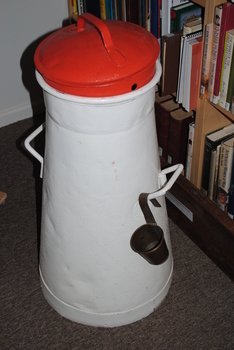 We have many household articles from early Anglesea homes. Records and preserves history of the European settlement of the district. 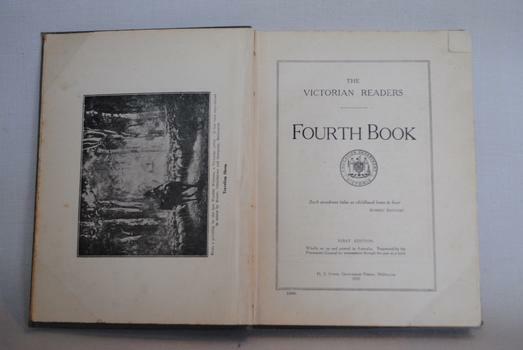 Our collection includes a small amount about the local aboriginal people, the Wautherong. Glorious Anglesea . 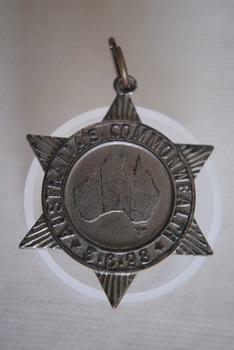 . .
Star shapped medal issued in 1898 tocommemorate the forthcoming Commonweath of Australia - a map of Australia in the centre divided into six states/colonies, each state represented by a ray - inscribed around the circumferance and with provision for a pin to be attached with hole and metal ring on the top ray of star. Back of medal perfectly plain. 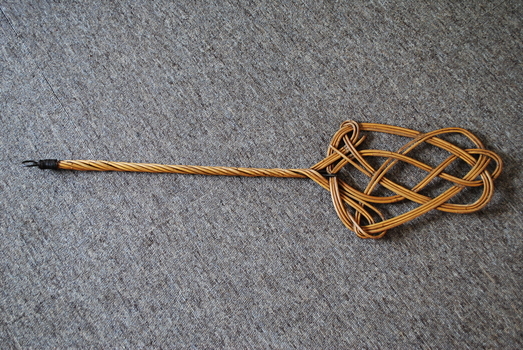 Cane carpet beater. 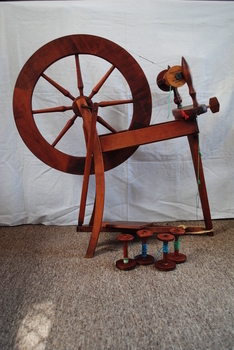 Carpets and rugs would be hung over a clothe's line and beaten with this carpet beater to get the dust out. Metal wire loops around cane head to bottom of handle with loop for hanging up when not in use. 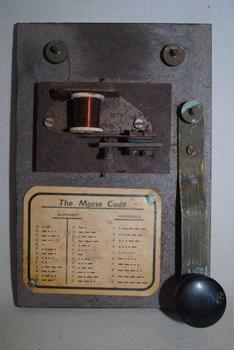 Block of masonite with cardboard sheet "The Morse Code" attached, has metal lever with black knob, small block of masonite with reel of copper wire mounted on it and three terminals. 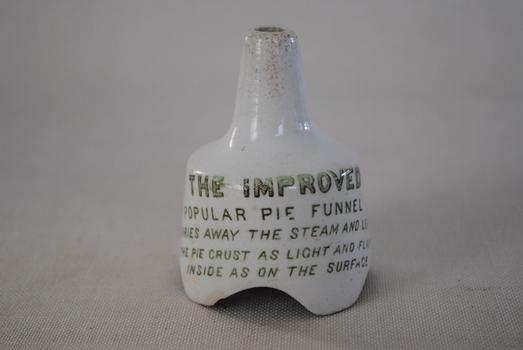 This pie funnel is a hollow ceramic device and is shaped like a funnel or chimney. 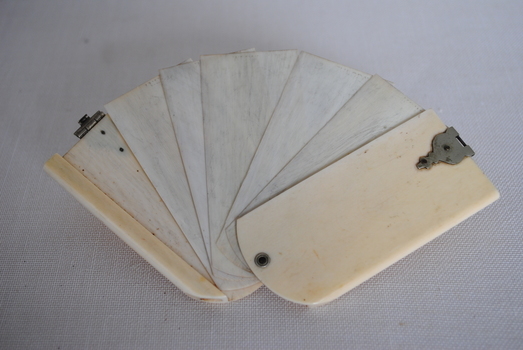 It is used for supporting or venting a pie. Beige/stippled. The improved popular pie funnel. Carries away the steam and leaves the pie crust as light and flakey inside as on the surface. Foy & Gibson Pty Ltd, Collingwood. (green printing). 1. 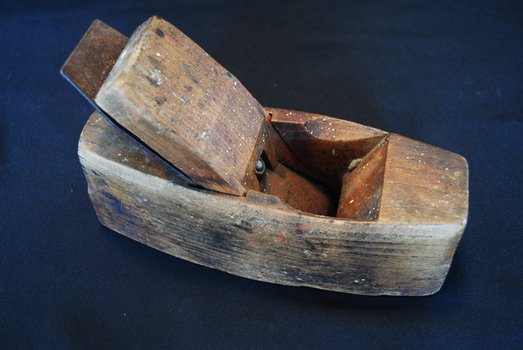 Rectangular block of wood with shallow lozenge shaped cut out on one side. 2. Rectangular block of wood with planed edges. 3. 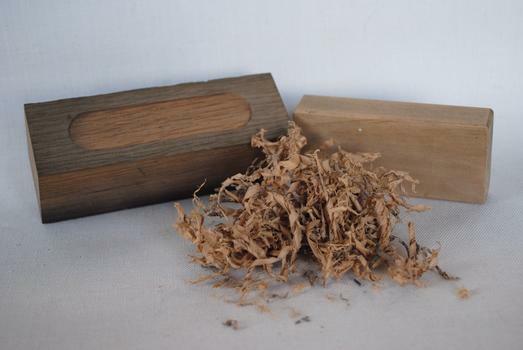 Shavings of white oak timber recovered from hull of "Lightning" contained in glass jar. 1. and 2. have "Lightning" written on them. This linesman's handset has an earpiece, a mouthpiece, a dialling interface and a set of test leads for connecting to the telephone circuit. 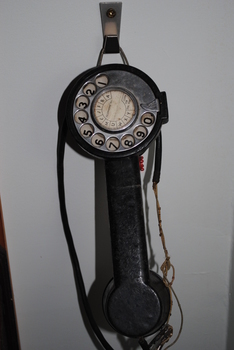 This handset has a rotary dial and a hook for hanging the set from a toolbelt. Made of black bakelite. Patent - for improved number dial. Metal sheath with a screw just below the throat and a hook or stud to facilitate wearing the sword. 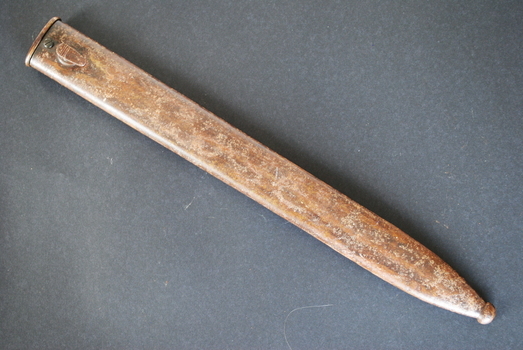 The blade's (absent) point is further protected by a metal extension called a drag or shoe. Brownish in colour. Has a large dent on one side. 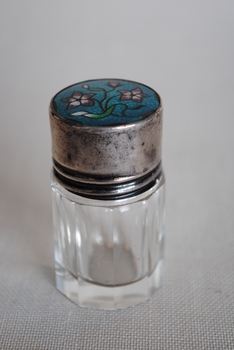 Small glass bottle with enamel lid. Silver lid with 2 pink/purple flowers and 2 flower buds on stem with green leaves on turquoise background - enamel top. Silver hallmarks: Anchor - Birmingham. Lion - British. 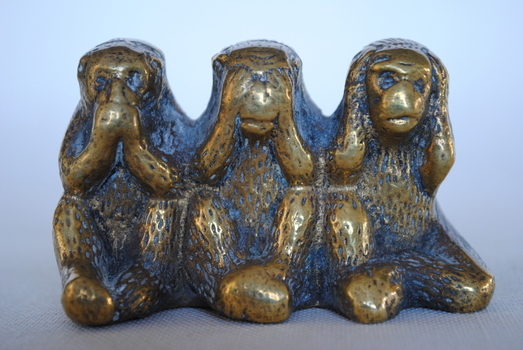 Brass ornament of Three Wise Monkeys. Hollow base. Case with brass clip containing six ivorine moveable slides for notes. 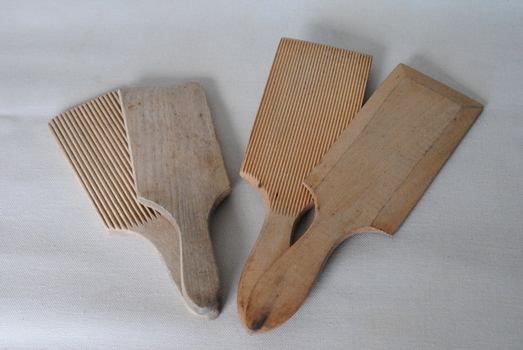 A tool for shaping wood - to flatten/reduce the thickness of and leave a smooth surface on a rough piece of timber. White milk tin with red lid. Probably 10 gallons in size. Includes a measuring cup with 1/2 pint printed on it. On ladle: 1/2 pint B.C. Vic. No other markings. Red painted lid. White body. 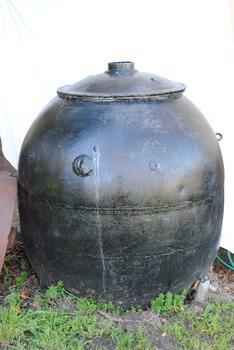 Metal sea mine casing manufactured for use in WW2 that has since been converted for domestic use as an incinerator - spherical body now quite rusty and bottom layer of lid quite corroded around entire circumference - has two handles attached to upper section of shell and holes and metal fittings between them - small hole in centre of lid. Medal struck on a shield-shaped flan with a crown and loop at the top. The coronation of Edward VII in 1902 prompted major celebrations in Australia. This medal probably issued to school children in Victoria. 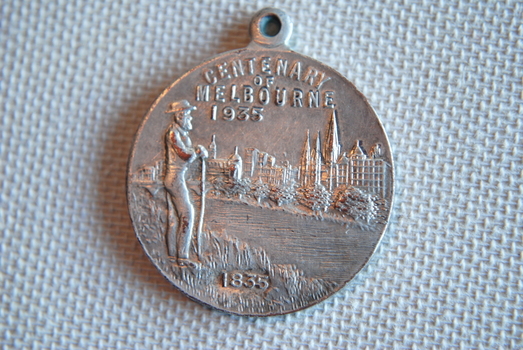 Over 40 different medals were produced in Victoria. 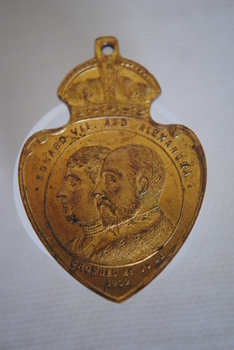 Obverse: At centre, within line circle conjoined busts of Edward VII and Queen Alexandra; Around: EDWARD VII AND ALEXANDRA; Below: CROWNED 26 JUNE 1902. Reverse: Above: Small rising sun emblem, EDWARD VII / KING AND EMPEROR / ACCESSION 22.1.1901 / CORONATION 26 JUNE 1902. GOD SAVE THE KING / AUSTRALIAN. Around below: COMMONWEALTH CELEBRATIONS. 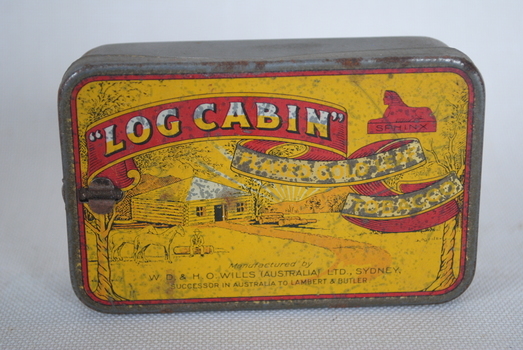 Small tobacco tin. Yellow with red banner. Showers picture of house, path, two horses and a man sitting on a log with mountains and trees in background. 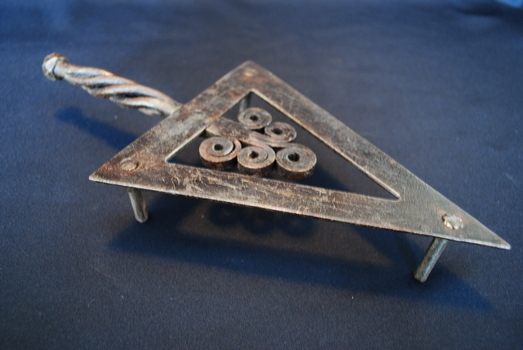 Metal trivet for holding iron. 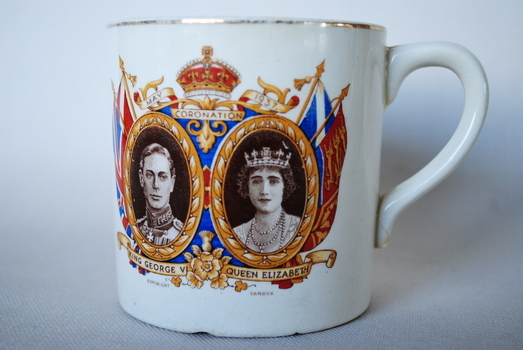 Coronation mug souvenir of George 6th and Queen Elizabeth issued to celebrate the royal visit to Australia in 1949. White china mug with pictures of George 6th and Queen Elizabeth under crown and dated May 1937 with flags flanking them. On back marked "Issued to celebrate the royal visit to Australia 1949". Marked: BCM/Nelsonware. Made in England. Gold edging around rim and on handle. Heavy metal iron with heat shield beneath wooden handle. Letter "S" on damper door. Has tubular air chamber built into bottom section which connects to damper door allowing air to circulate creating the draft needed to keep fuel burning. Heat shield decorated. Wooden knob on the metal lever which opens the hinged top section. 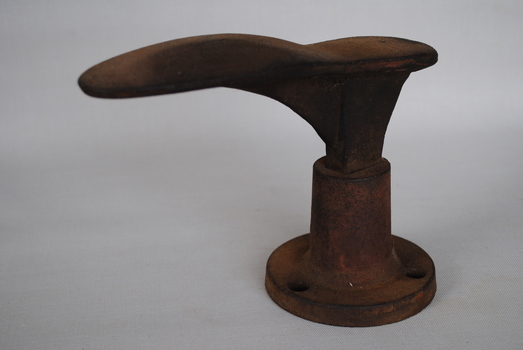 This section incorporates a 46mm diameter opening on the funnel at the pointed end of the iron. 1. 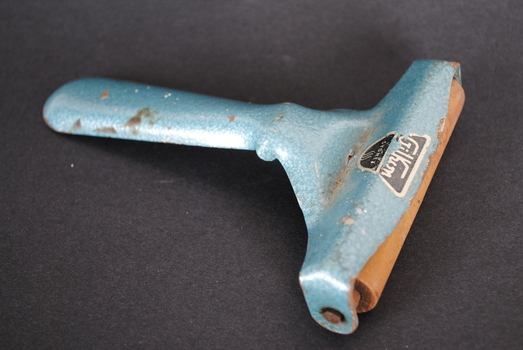 Blue metallic Brayer - 100mm x 150mm x 20mm. 2. Wooden handle Brayer - 160mm x 130mm x 20mm. 3. 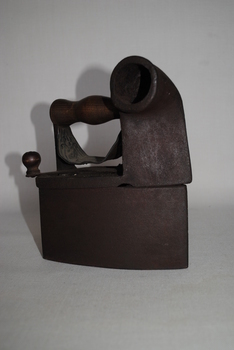 Wooden handle Brayer - 120mm x 140mm x 30mm. 1. "Gilkon / SYDNEY" across top. 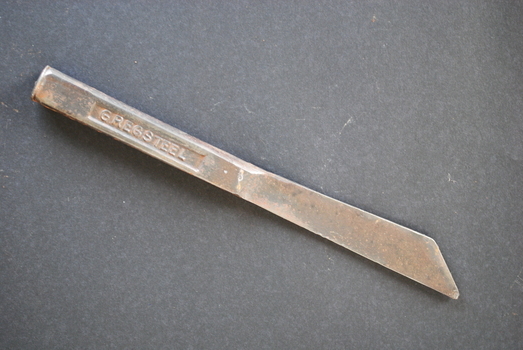 A Gregsteel Plugging cold chisel which is sought after due to excellent edge-holding properties. Used by bricklayers (Gregsteel 279) to remove mortar from between bricks to allow for a timber plug to be inserted to allow skirtings and architraves to be fixed to it. 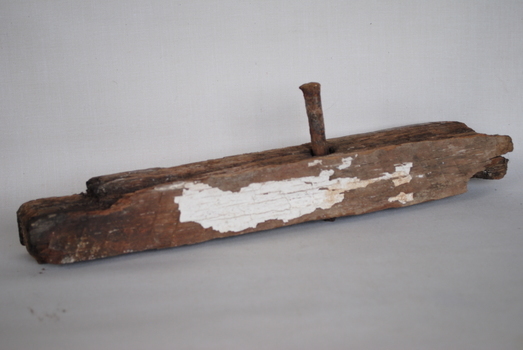 This object may have been used as a timber paling knife. 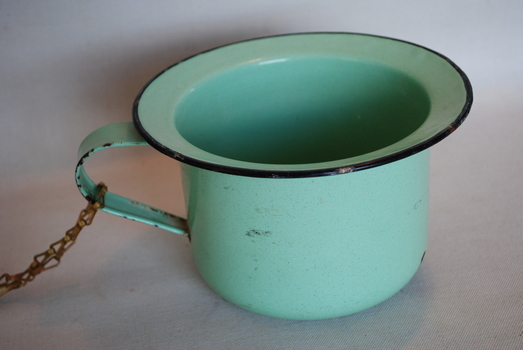 Plain green enamel chamber pot with black trim. 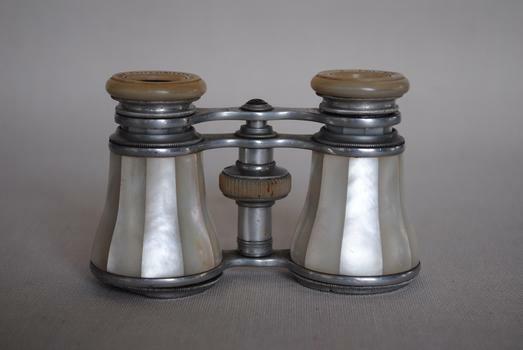 Mother of pearl and silver coloured metal opera glasses. Metal top section and connecting focus adjustment fitting has finely beaded edging on all circular areas. L/H top inscribed "K.U.K. HOF U. UNIVERSITATS OPTIKER WIEN". R/H top inscribed "F. FRITSCH ALSERSTRASSE 17".